During the colonial and post-colonial period, philosophers in India were found making desperate attempts to depict Indian philosophy as something at par with European philosophy, especially with the one evolved out from modernity. Barring the merit that such attempts made Indian philosophers view their own tradition critically, it only helped accelerate the fall of genuine philosophizing in this land; the community kept itself busy trying to match up all that they had with ideas that came from the West, which they took to be the standard or marker of true philosophy. Among these attempts, one was to draw a parallel between Indian idealist theories of consciousness and some of the theories in contemporary physics, especially the Quantum theory. 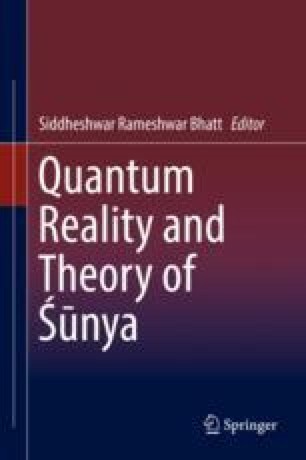 Sundar Sarukkai has argued that modern science, particularly Quantum theory, is a discourse that seems unique in many respects and hence to claim that some elements of it are actually what the ancient Indian thinkers were talking about is to mistake the nature of both Indian philosophy and modern science. Even as I agree with him in principle, there remains a strong feeling that if one is willing to conceive theoretical exercises, be it philosophy or science, as belonging to one single clan, there is a bright possibility to find some of our ancient theories as being complementary to many theories in modern science. Buddhist Śūnyavāda propounded by Nāgārjuna seems to be a bright example for this: though the theory leaves a general feeling in us that Nāgārjuna is attempting to establish scepticism, at the heart of it, the theory does much more than we explicitly acknowledge. The present paper argues that Nāgārjuna’s thesis should be identified as an attempt to provide theoretical explanation to the question why metaphysical realism fails, more than that it provides an alternative to metaphysical realism in conceiving reality.